Today's Photoshop tutorial, I will show you How to Convert Negative Into Digital Photo, change clothe and repair photo. 1st Scan your Negative film. First we need to shot the negatives. 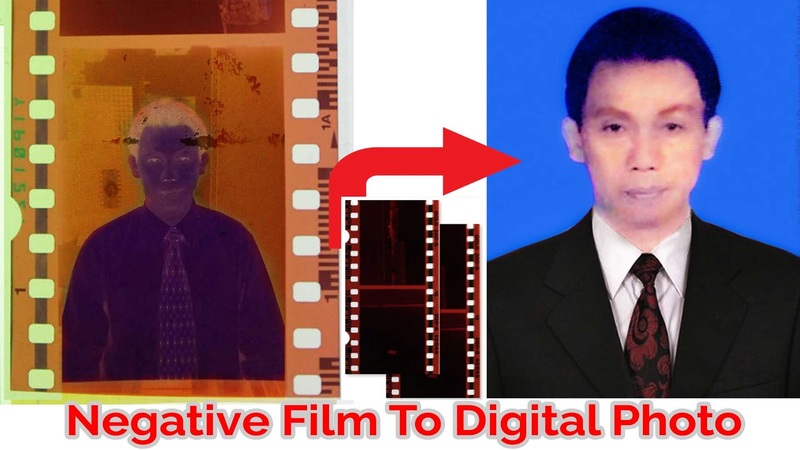 Make sure that your negatives are clean before digitizing them. You must have background any soft white LCD screen / Mobile Torch or shiny sun to look it clearly. Now take shots. Transfer the images from your camera to computer. Open photo in Photoshop. Choose the Crop tool and remove top, bottom and sides portion of a photo. Go to adjustments and select invert or CTRL + I is keyboard shortcut. This photograph is very old one so you may notice lot of scratches and dust on the photo. To fix the colors add curves adjustment. Open red channel, move black handle at starting point of the curve and drag white handle at end of the curve. Do the same method as red channel for the green and blue channels. That's it we are done. Now remove the scratches and dust form photo by using stamp tool / brush tool, for blacking hairs use burn tool.